British film drama Atonement leads the race for the 2008 Golden Globe Awards after being nominated for seven prizes. Actors James McAvoy and Keira Knightley have been shortlisted for the World War II story, as has director Joe Wright. Helena Bonham Carter, Julie Christie and Daniel Day-Lewis are among the other UK film stars with nominations. 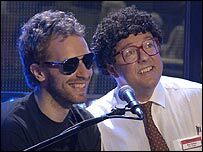 Hugh Laurie, Ricky Gervais and Minnie Driver are also in the running after being nominated for their TV shows House, Extras and The Riches. The Golden Globes, handed out each year by the Hollywood Foreign Press Association, is one of the main events in the run-up to the Oscars on 24 February. Unlike the Oscars, the Globes ceremony - to be held on 13 January at the Beverly Hilton in Los Angeles - has one set of categories for dramas and a separate set for comedies and musicals. Atonement's other nominations include best film drama, best screenplay and best original score. Thirteen-year-old Saoirse Ronan also gets a nod in the best supporting actress category. Based on the novel by Ian McEwan, it tells of an ill-fated love affair that unfolds before and during World War II. Knightley said: "I'm absolutely thrilled, and it's so wonderful that the film has been nominated in so many categories. I adored making it, and am delighted for Joe, James, Saoirse and everyone involved." Atonement is one of seven nominated for best motion picture drama. Three crime thrillers also make the shortlist - Sir Ridley Scott's American Gangster, David Cronenberg's Eastern Promises and the Coen brothers' No Country for Old Men. The other shortlisted dramas are Denzel Washington's The Great Debaters, Michael Clayton, starring George Clooney, and oil industry saga There Will Be Blood. Three musicals are nominated for best comedy or musical - the Beatles extravaganza Across the Universe, Hairspray and Sweeney Todd. Political satire Charlie Wilson's War and teenage pregnancy comedy Juno complete the category. Day-Lewis's best dramatic actor nomination is for There Will Be Blood, while Christie is cited for her performance as a woman with Alzheimer's in Away from Her. Bonham Carter, meanwhile, is nominated for Sweeney Todd, as is her director-partner Tim Burton and co-star Johnny Depp. 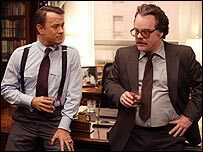 Two actors have received two film nominations - Philip Seymour Hoffman for The Savages and Charlie Wilson's War, and Cate Blanchett for Elizabeth: The Golden Age and I'm Not There. The Australian star is shortlisted in the best supporting actress category for the latter film, in which she plays musician Bob Dylan. 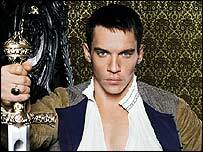 Historical saga The Tudors, a co-production between the BBC and HBO, has a strong presence in the television categories, with nods for best TV drama and best actor for Jonathan Rhys Meyers. Former Brookside star Anna Friel, meanwhile, is up for best comedy actress for her US show Pushing Daisies. Ricky Gervais's sitcom Extras is nominated for best comedy, while Gervais himself is up for best comedy actor. British actress Ruth Wilson gets a citation for the BBC's Jane Eyre and other British actors shortlisted for their TV work include Jim Broadbent, Andy Serkis and Samantha Morton - all for Channel 4's Longford. Former Cold Feet star James Nesbitt also gets a consideration for his role in the BBC's Jekyll. Kill Bill director Quentin Tarantino announced the main nominations on Thursday at the Beverly Hilton. He was joined by actor Ryan Reynolds and Hayden Panettiere, star of TV series Heroes.